These beef bits are nice to nibble on and easy to make. You can substitute Asian chili sauce for the sambal oelek in both the beef and the peanut sauce. Sambal oelek is available in the Asian section of most grocery stores. Mix together hoisin sauce, soy sauce, brown sugar, sambal oelek and gingerroot in bowl. Add beef; toss to coat. Cover and marinate for 30 minutes. Remove beef from marinade; discard marinade and thread cubes onto 15 soaked wooden skewers or metal skewers. Season with salt and pepper to taste. 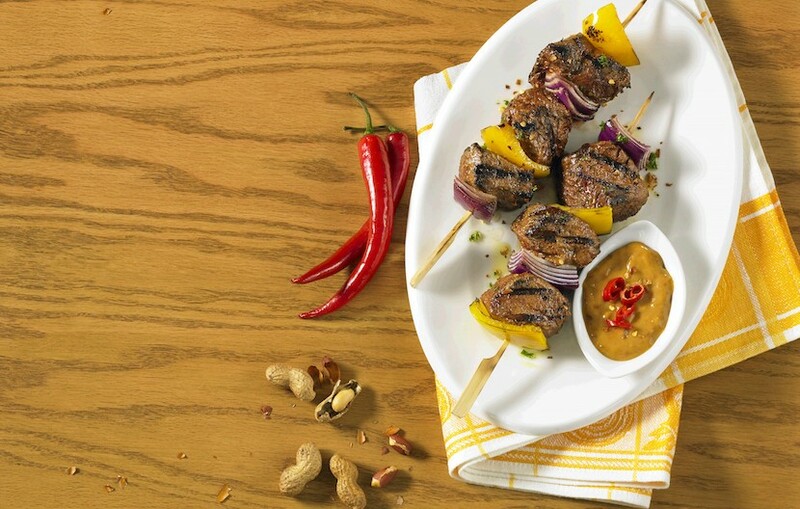 Place skewers on foil-lined rimmed baking sheet. Broil, turning once, until browned yet still pink inside, about 6 minutes. Serve with Peanut Dipping Sauce. In a medium saucepan, combine garlic, peanut butter, chicken broth, soy sauce, lemon juice, garlic-chili sauce and granulated sugar. Bring to a boil over medium high heat, stirring often. Stir in coconut milk and cook, stirring until heated through. Serve warm.